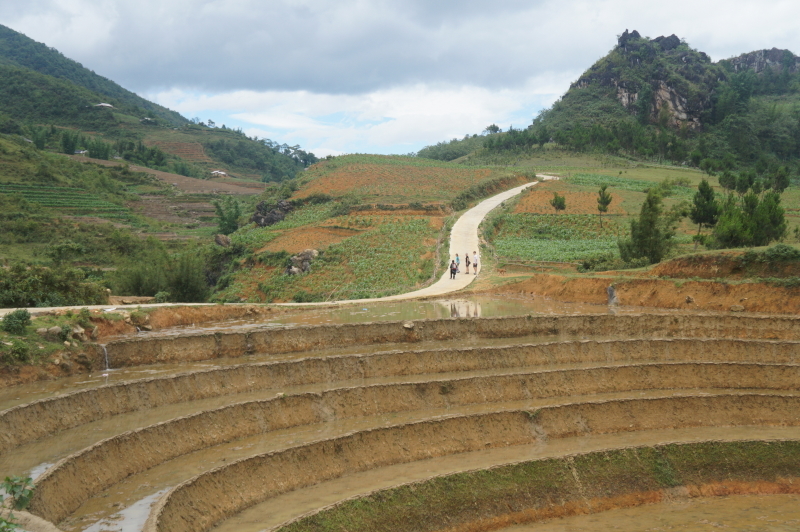 Trekking in Sapa | Hello Cool World! 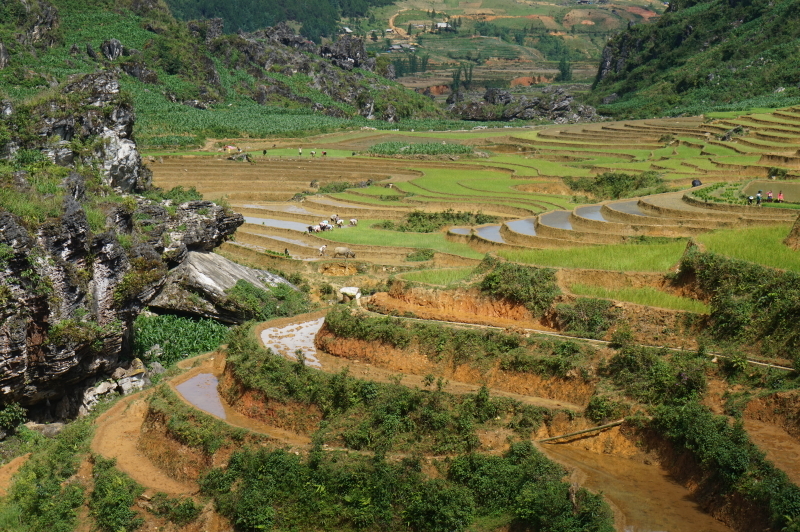 There is amazing beauty in rural Vietnam, from the spectacular views over terraced rice fields to the warmth and open hearts of the people. 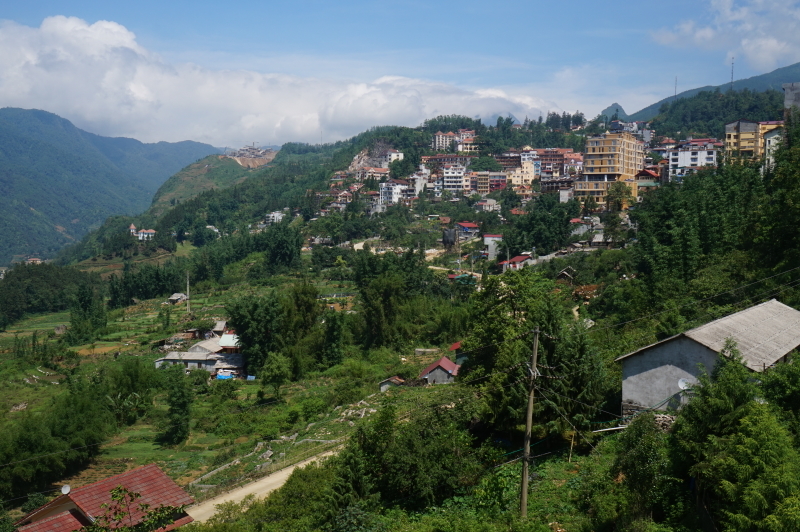 Looking to escape the heat again, and to see for ourselves the beauty of the mountain region of Vietnam, we jumped on an overnight bus in Hanoi and headed northwest about 9 hours to the small hill town of Sapa, which is located not too far from the border with China. Originally established as a retreat where the French could escape from the heat of the plains, the town has grown into one of the ‘must visit’ places in the country. 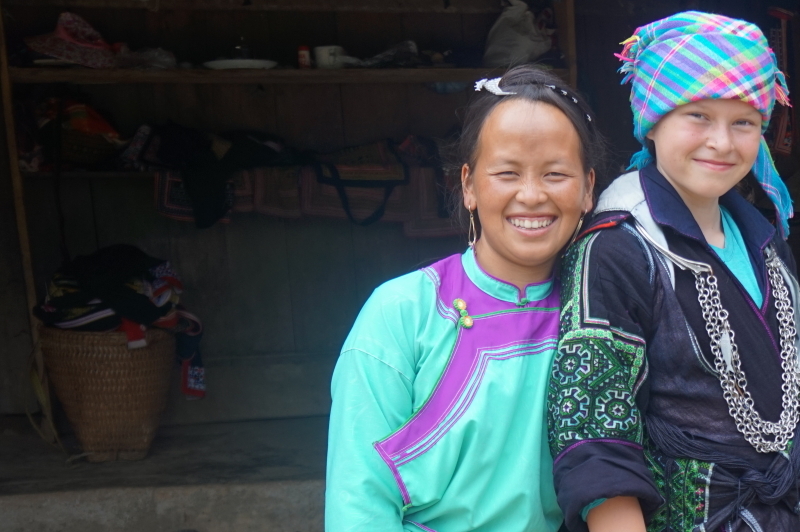 This is due to the amazing trekking to be had, as well as the opportunity to meet with various ethnic minority groups that populate the area. 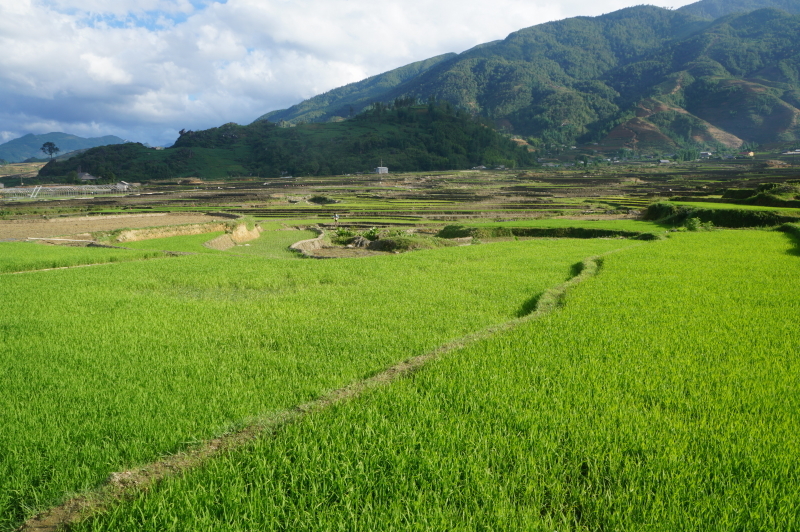 The five main groups include the Hmong, the Dao, the Tay, the Giay, and the Xa Pho. 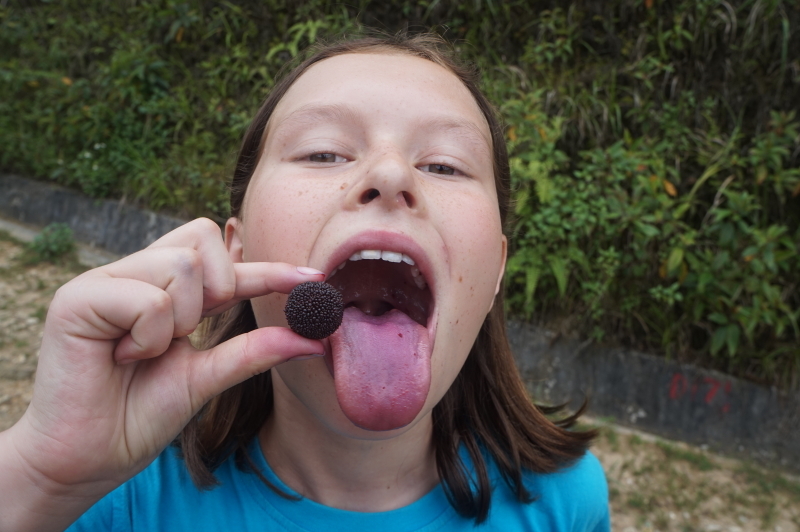 On our first day we took it relatively easy as we didn’t sleep much on the bus and arrived early in the morning. 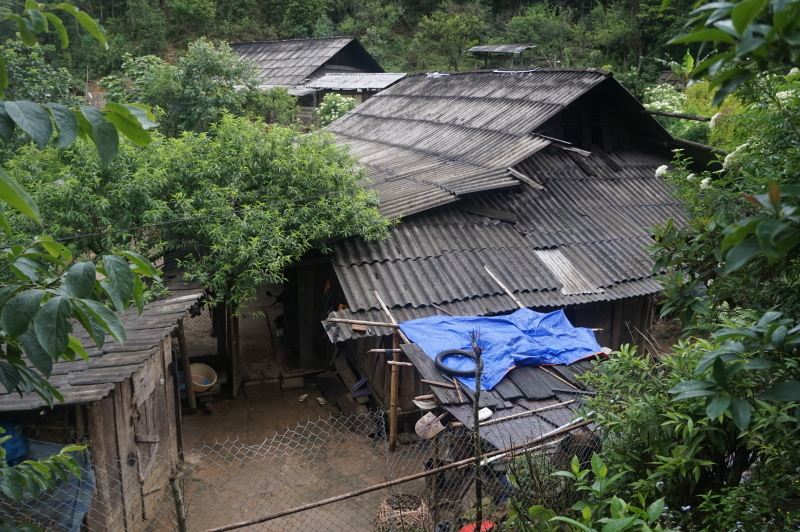 We did, however, get our hiking legs warmed up by paying a short visit to the nearby tourist village of Cat Cat. 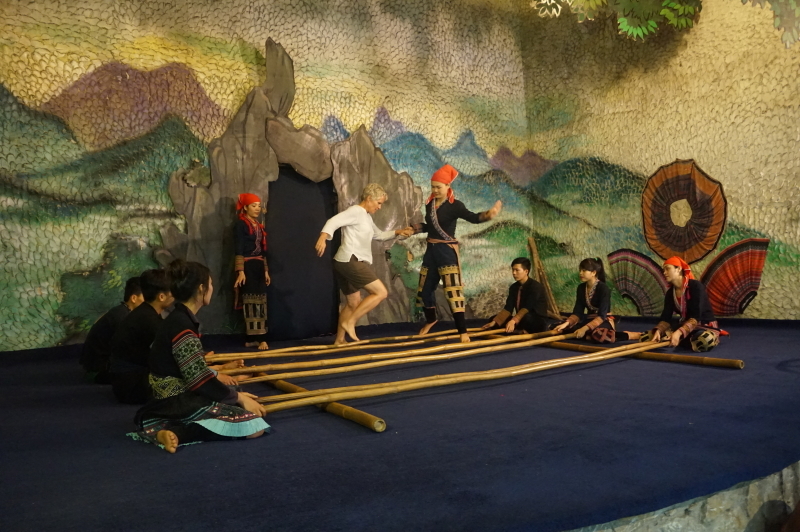 While there we were treated to a traditional dance performance. We clearly were sitting too close to the front as I was selected from the audience to join in the bamboo dance toward the end. Once I got the hang of it, it wasn’t too difficult. 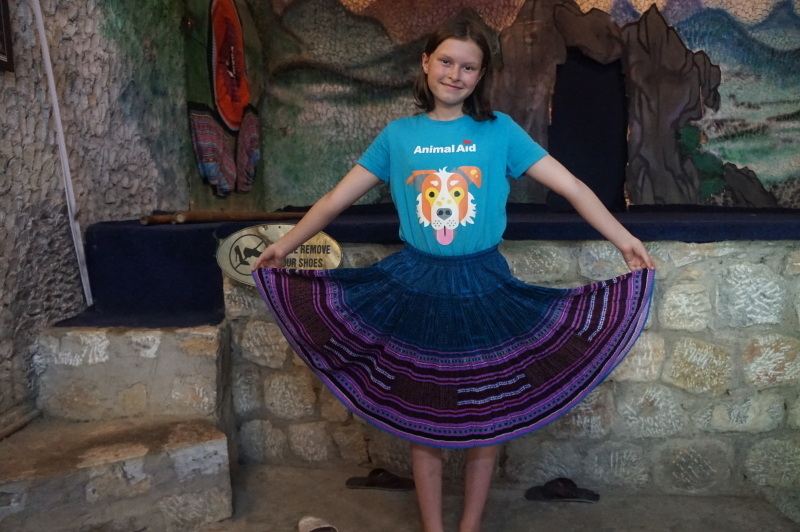 …and Eva got her first-day-back-at-school dress. 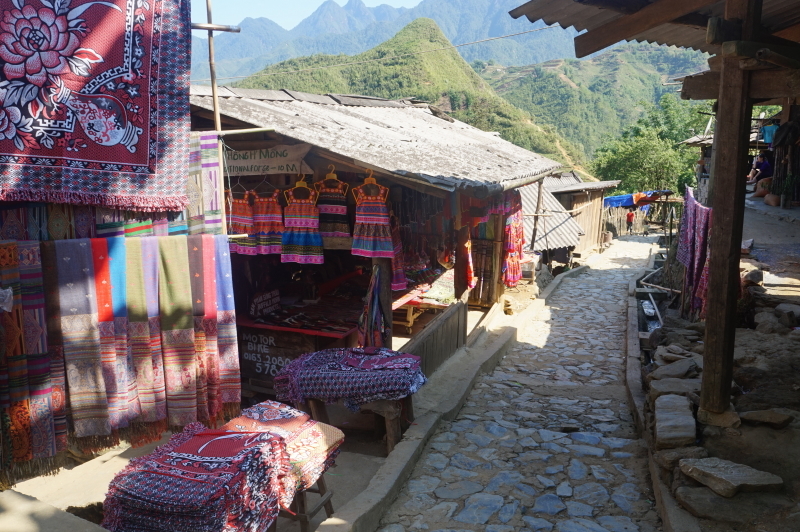 Wanting to experience both the trekking and the local culture, we arranged a 2-day trek with a Hmong-run social enterprise called Sapa O’Chau. 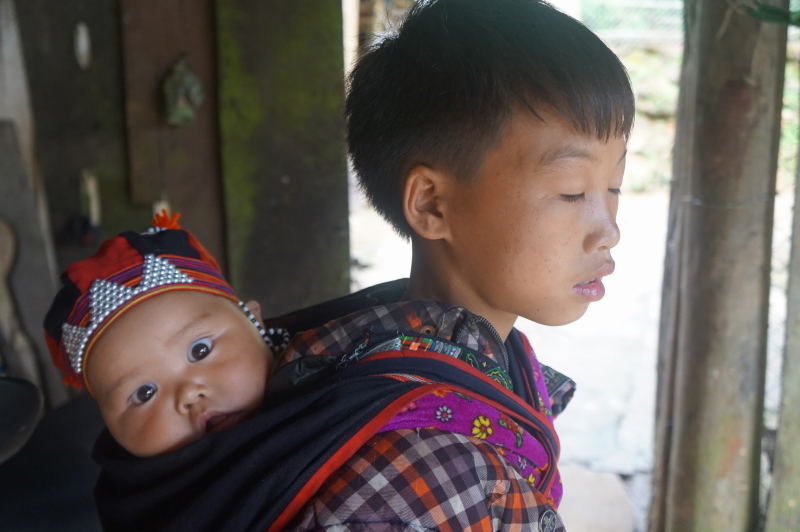 Chi, our lovely young guide, lives in a nearby Hmong village with her husband, three young children, and mother-in-law. 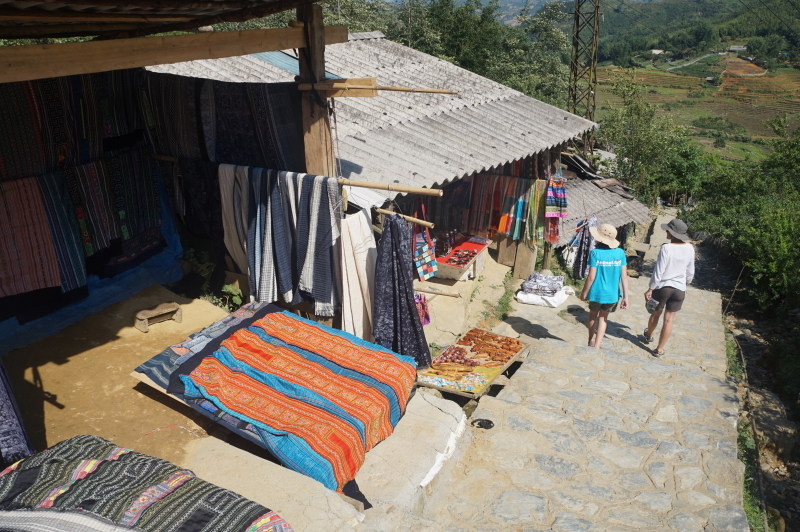 She never attended school and so for many years she earned an income, like so many other women, by selling trinkets and handicrafts to the multitudes of tourists that descend on the town. 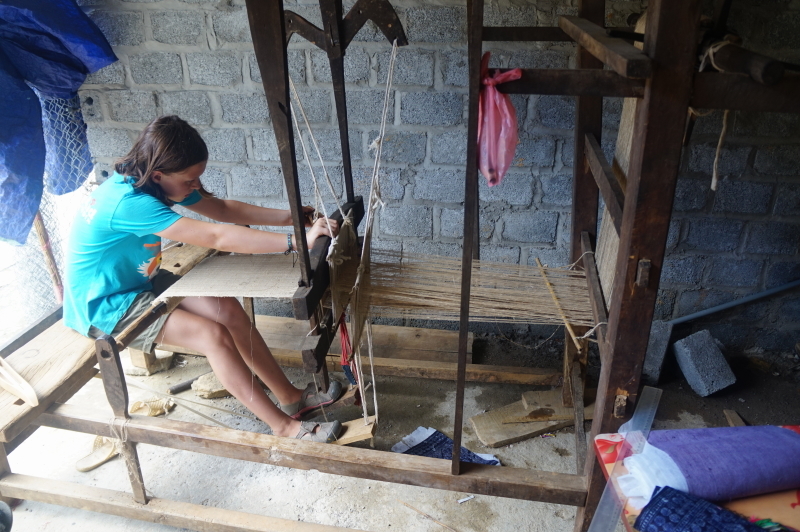 Through this work, she learned a sufficient amount of English that she is now able to work as a guide – and no doubt earn significantly more. 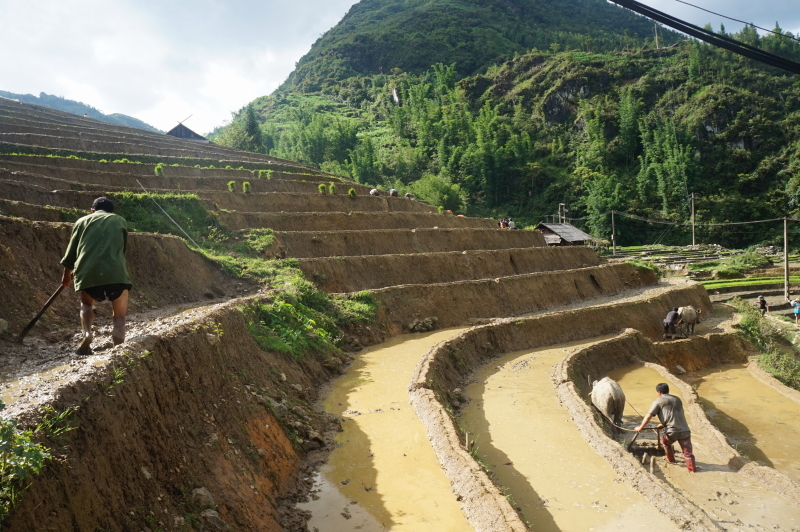 Despite this increased income, however, Chi, and the ethnic people in this region remain some of the poorest in Vietnam. 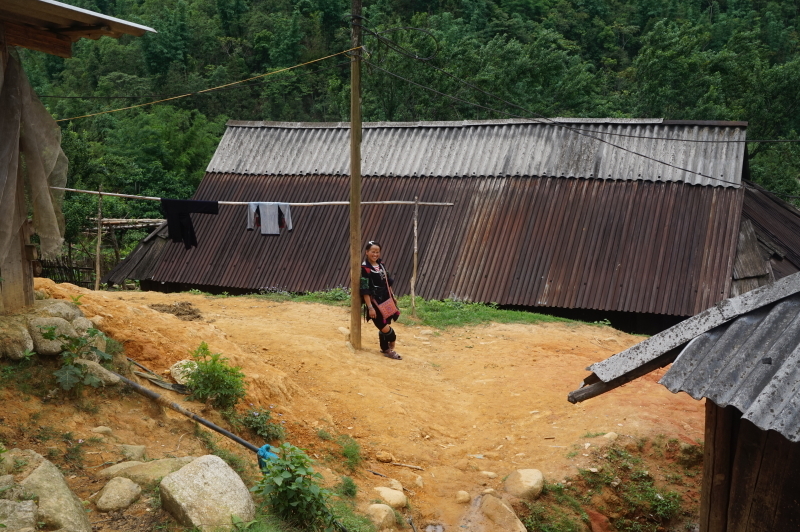 We met Chi early the next morning when we headed to the office of Sapa O’Chau. 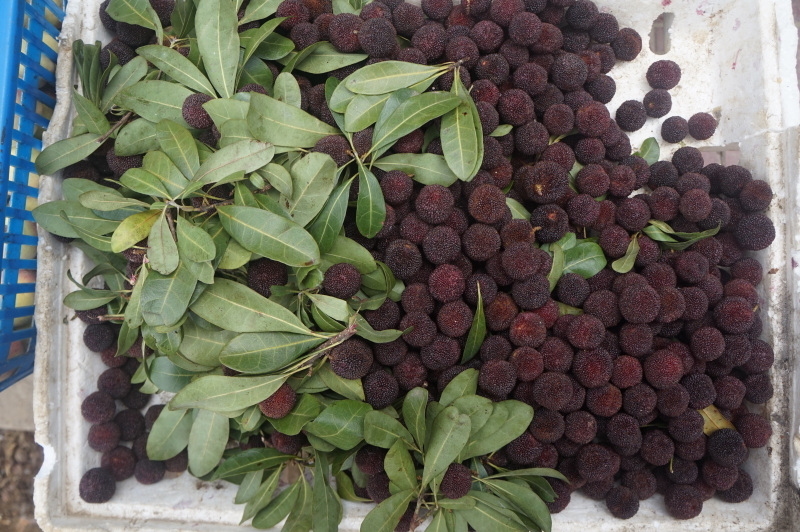 Once we had our strong, fortifying Vietnamese coffees, and a supply of Chinese strawberries (also known as red bayberries) from the local market (yum!! 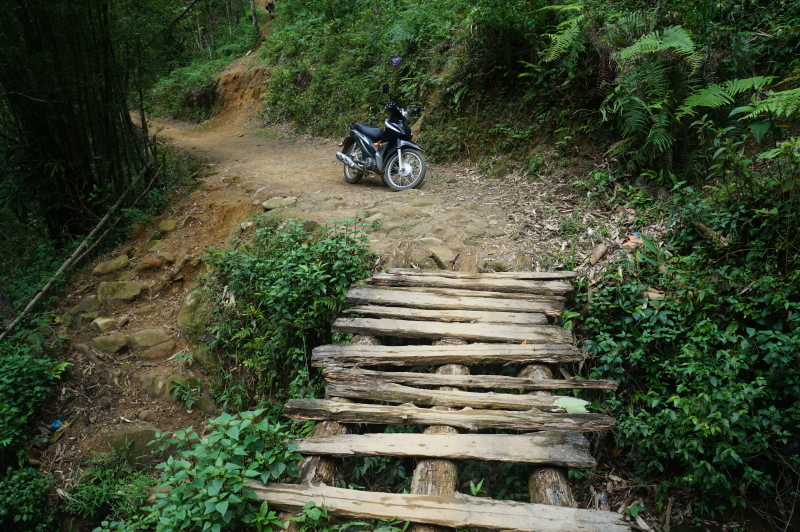 ), we hit the trail. 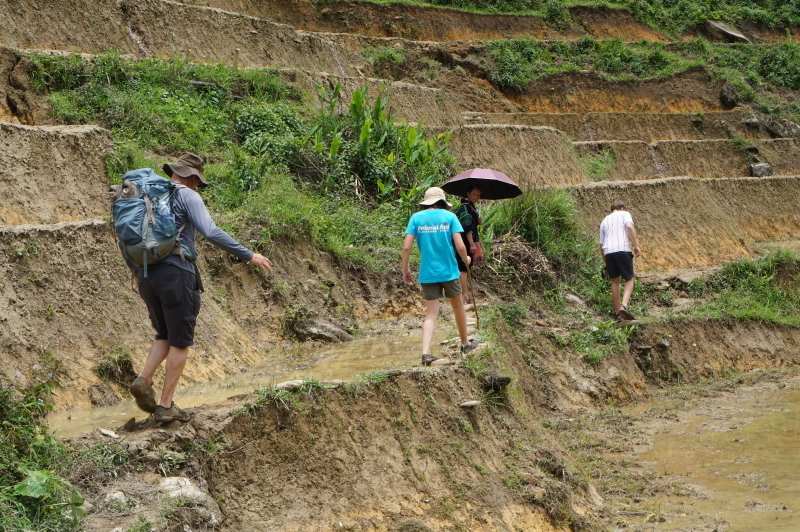 As we walked Chi proved to be an entertaining and delightful hiking companion, telling us loads about the local peoples and their way of life. She explained how her husband’s parents didn’t have a son and so they bought him from another local family. The price apparently goes up each year due to the increased amount of baby formula required for an older child. Our path took us through some small little villages and through the woods, which was lovely. 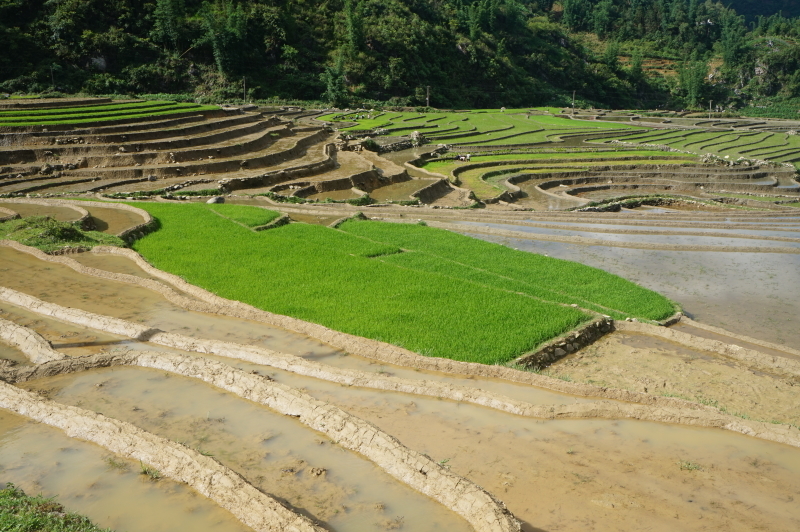 For much of the way, however, we picked our way through incredibly beautiful rice terraces in which the local people were hard at work planting rice. I don’t think I can imagine a more back-breaking job than this. 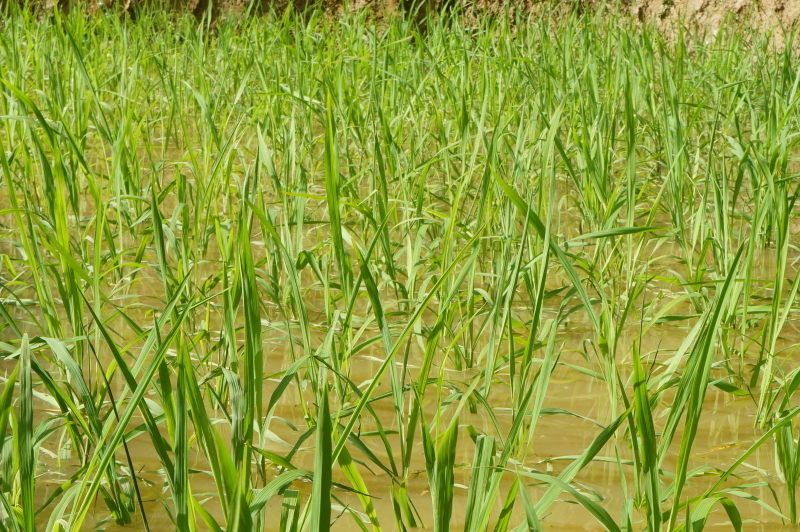 …and then you begin to see the work that goes into tilling the fields, sowing and transplanting the rice, and harvesting the crop. 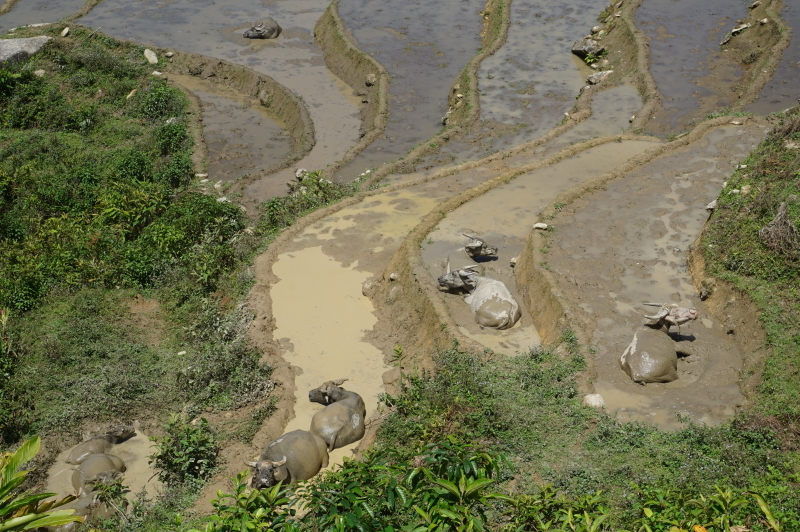 ..and across muddy rice paddies. 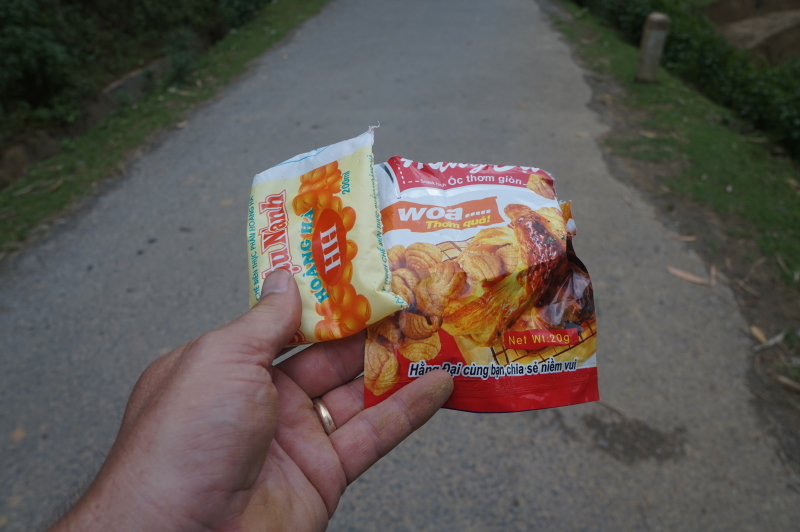 …and, of course, to pick up the litter from all the roadside stores selling packaged snacks. 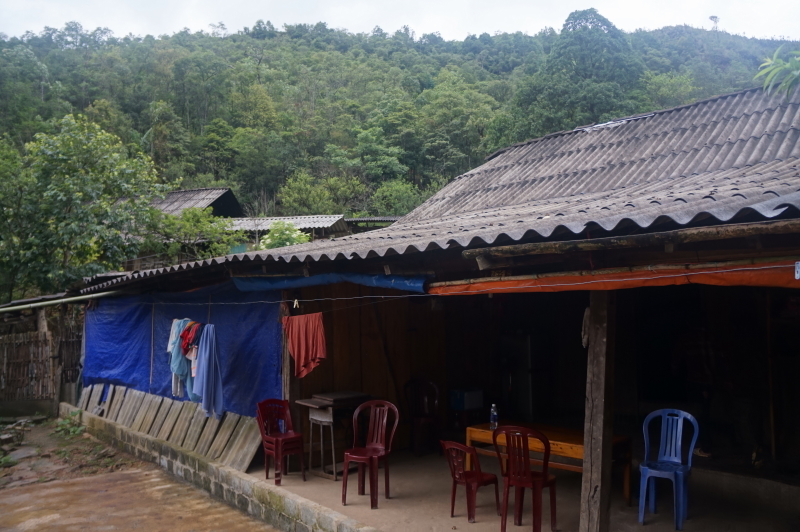 After a full day of trekking we finally made our way up the last hill and entered into the modest home of our host for the night. 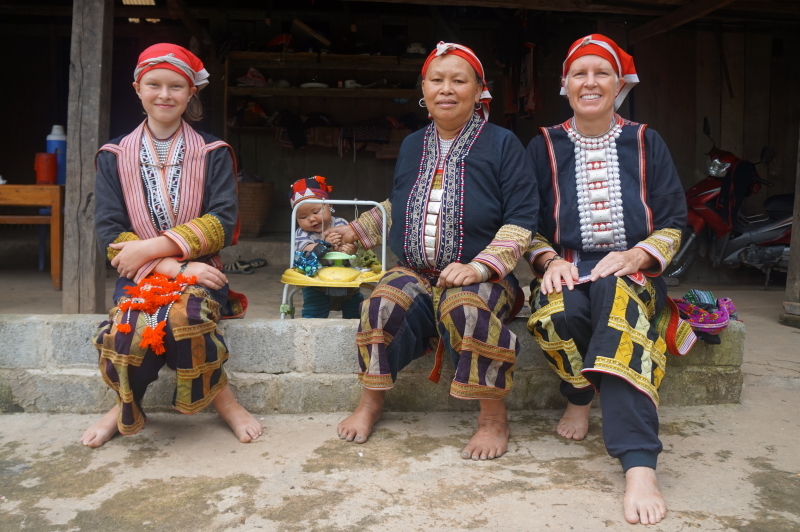 Mrs Phan Man May and her family are Red Dao, a group that is distinguished by their red head coverings – either a turban or scarf. Another distinctive feature is that the women shave both their hair and eyebrows. While I had read that it is done as a sign of beauty, Chi provided an alternative explanation. She explained that this practice emerged a long time ago when a newlywed wife was preparing food for her husband. A hair apparently fell into his food; he choked on it and died. Chi also explained that the practice of shaving is falling out of favor with the younger women, as is the wearing of the large red hats. 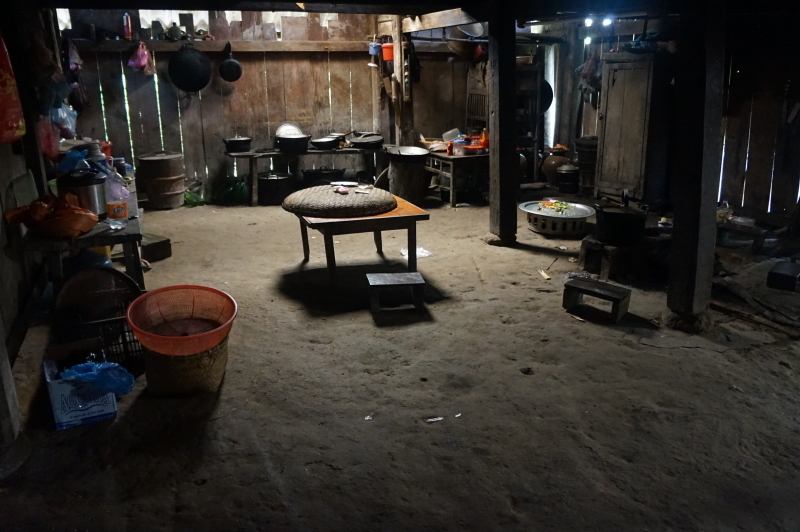 Inside the house: an open kitchen with two wood fire stoves, a dining area, and few electrical appliances. 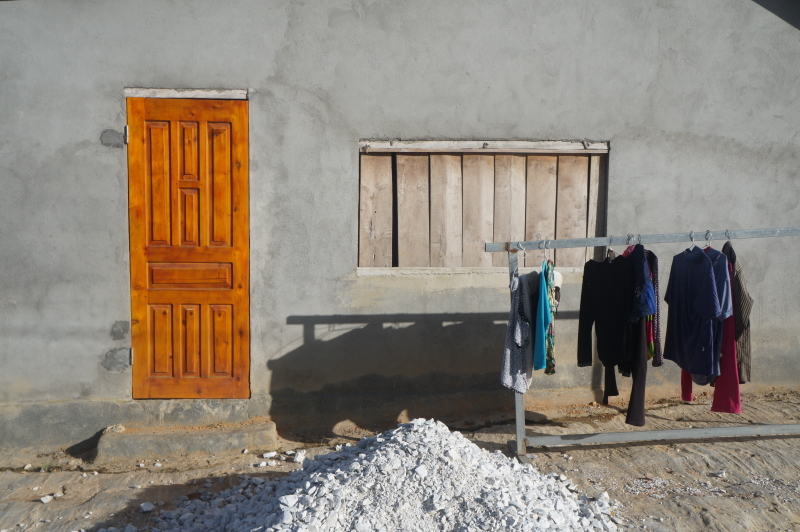 The house is shared by three generations. 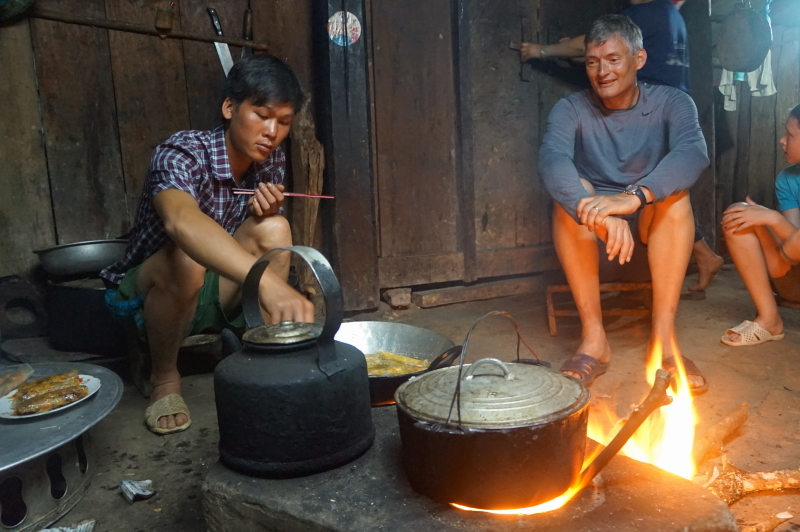 We had chosen to stay with a Red Dao family as we were enticed by the promise of a traditional medicinal bath. 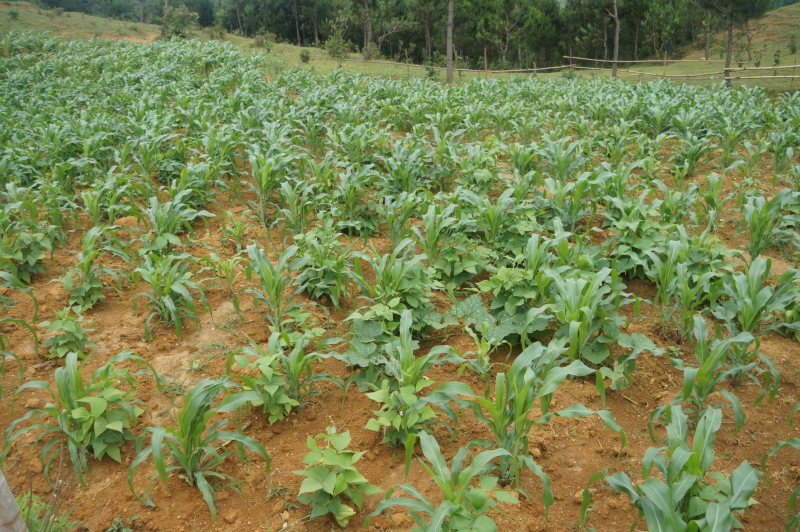 The Red Dao are apparently known for their expertise in herbal medicines. So, once we were settled in, and after we heard the hot water being poured into the tubs, Chi informed us that our baths were ready. Eva and I went first – it was heavenly!!! 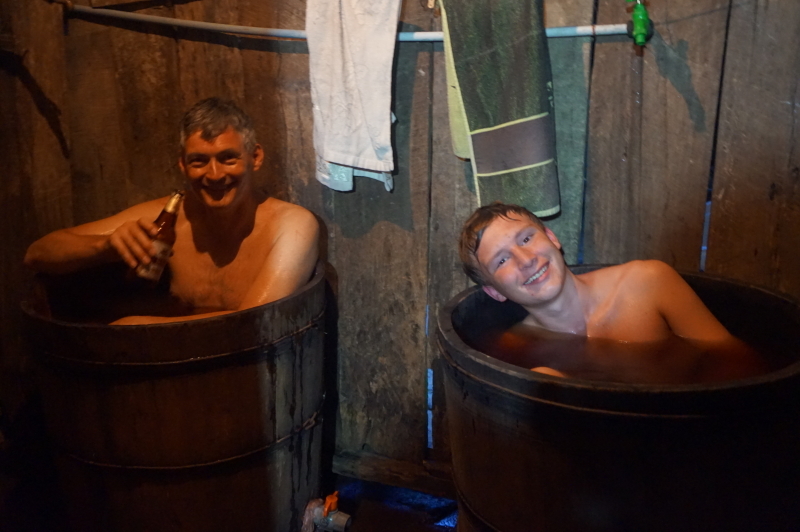 After our good long soak, it was Aran and Chris’s turn. Let’s just say they didn’t fit into the tubs quite as well as Eva and I. 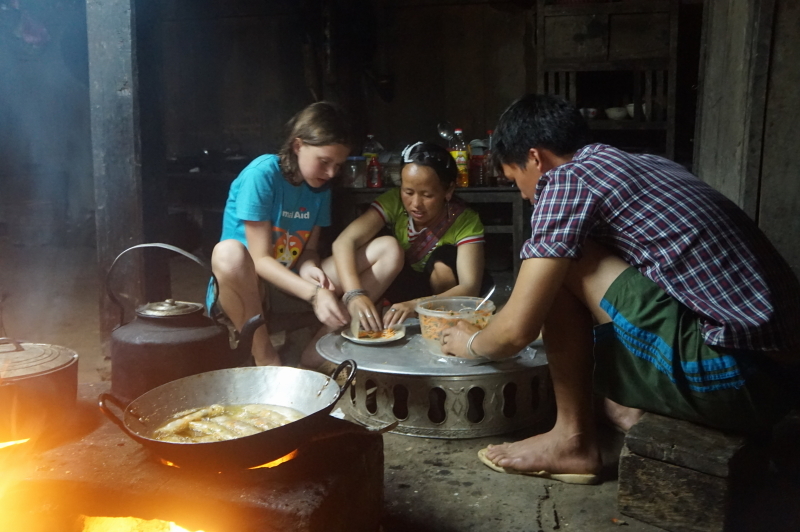 After our soaks, Aran and Eva helped out with the dinner by helping to make some spring rolls. 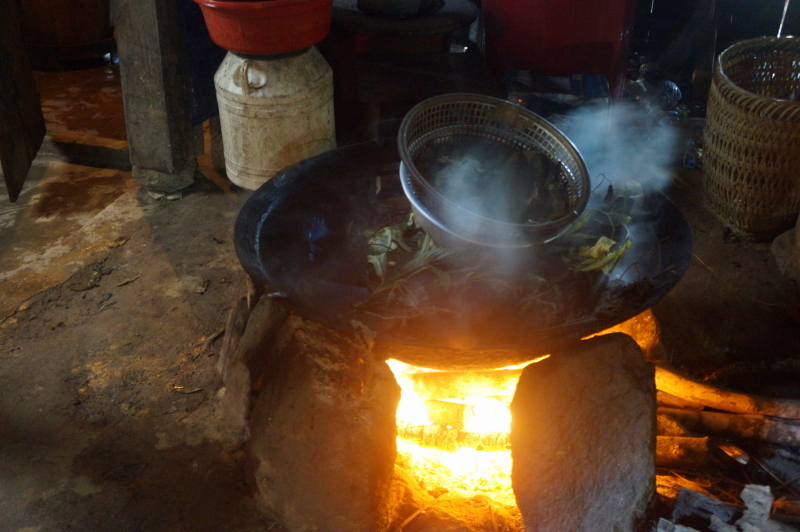 Everything was cooked over an open flame, and so once the rolls were ready they were fried in a big pot on the fire. That night we feasted on the most amazing meal: rice, tofu, fish, pork, a bamboo dish and spring rolls. 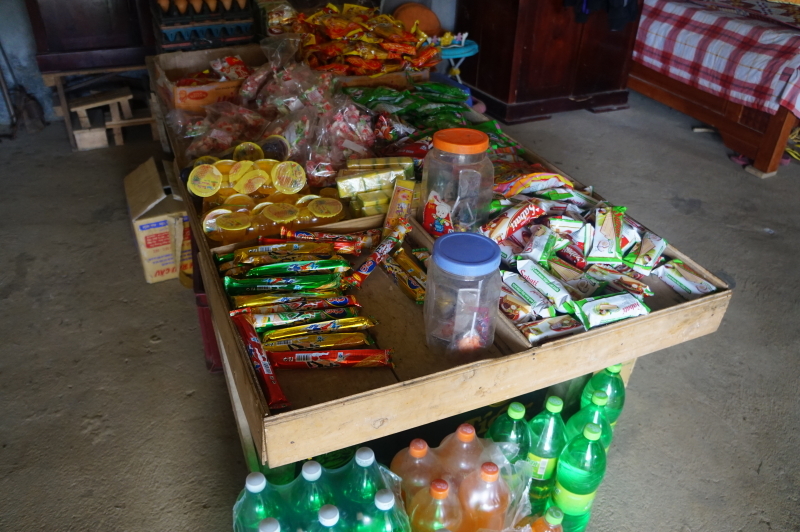 All of this was washed down with shots of rice wine, or Happy Water. Much to Aran’s delight we let him partake; apparently in these parts it is normal for children as young as 8 to enjoy this beverage. 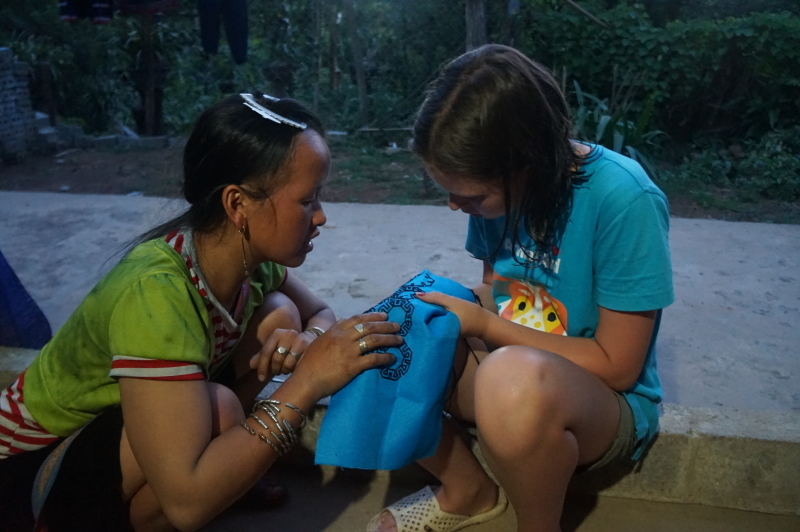 Chi gives Eva a lesson in stitching. All the women make their own clothes. 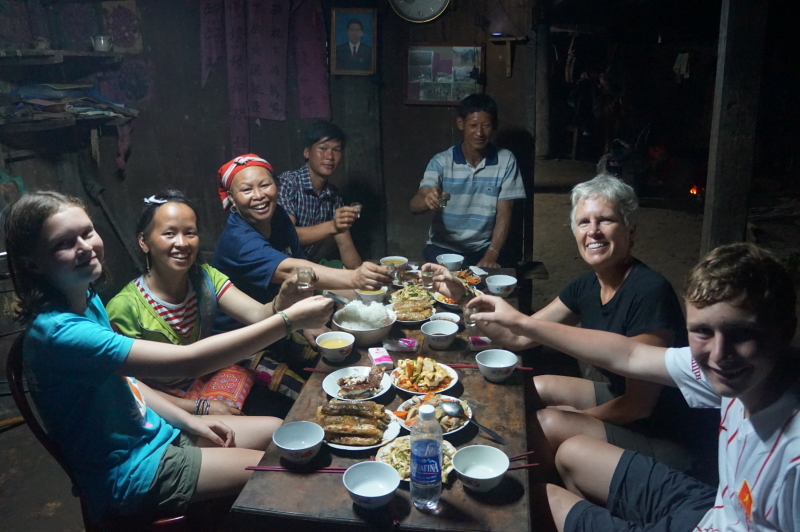 We toast our hosts, and thank them for a magnificent feast of spring rolls, chicken, pork, tofu, vegetables, rice and fish, all of which (with the exception of the fish) was grown locally on their farm. 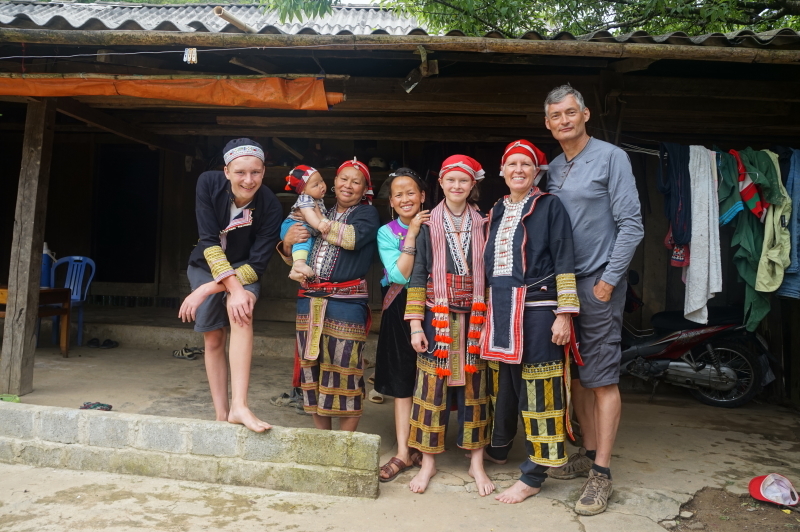 The next morning our host asked if Eva wanted to try on the traditional clothes. Eva had previously expressed her desire to do so to me alone, so she was thrilled when the offer was made. Unfortunately for Aran, people in these parts are much smaller than he is and so all he was able to squeeze into was a jacket. I was also offered an outfit but somehow didn’t carry it off with quite the same aplomb as Eva. 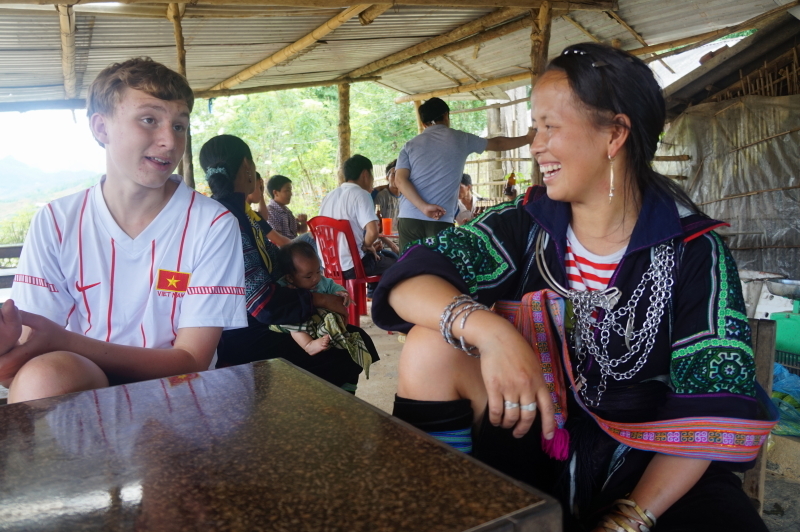 Only Chris managed to escape being dressed up – there are no six foot, 200 lb men in Vietnam. 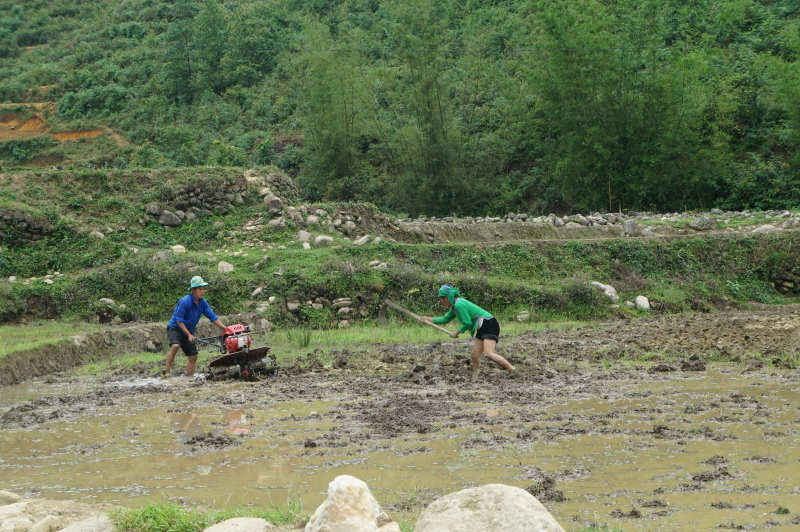 Once we were fed and watered, it was back on the trail for another 14 kilometers. 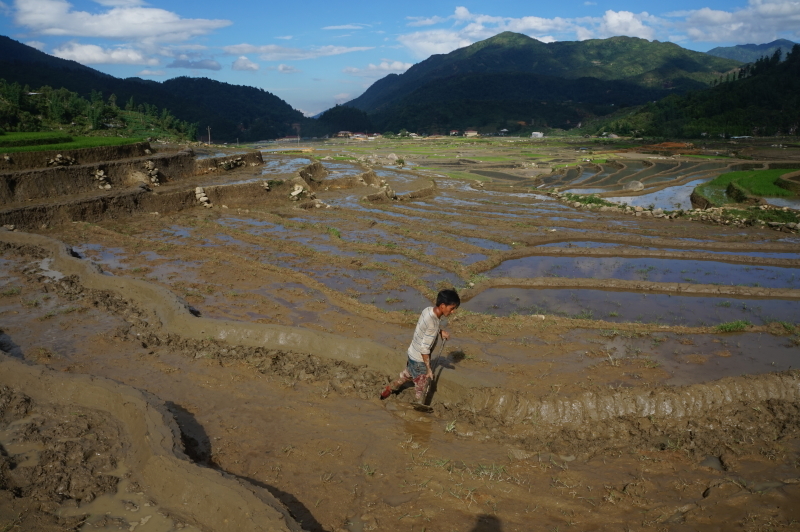 It was an equally hot day, with few places to get water, so it felt much further. 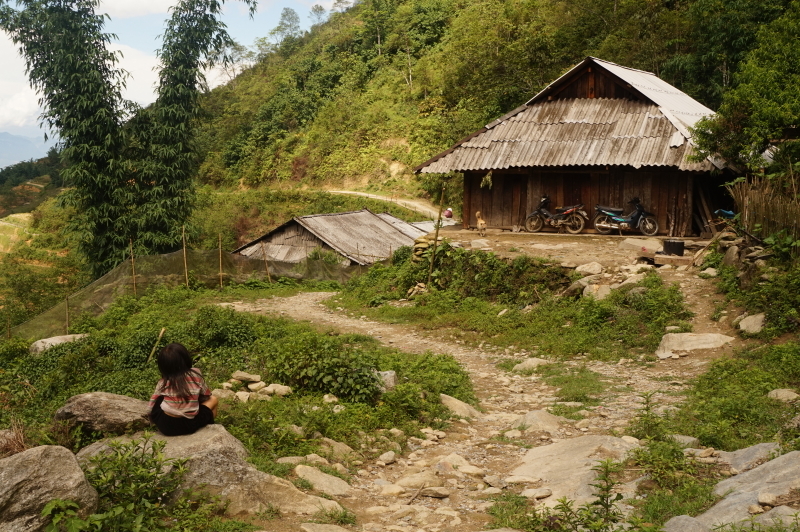 Nevertheless, when we finally arrive at our pick-up point, we were a happy, but tired lot. 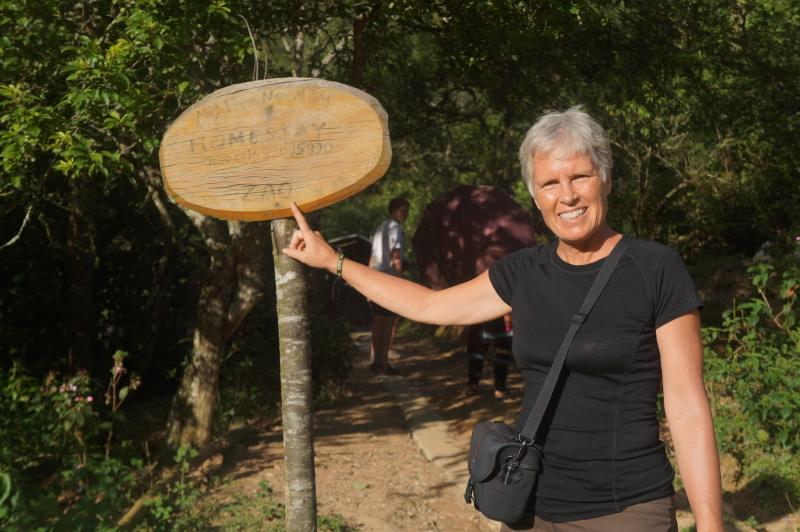 Another amazing trek in a gorgeous part of the world! Awesome pictures. 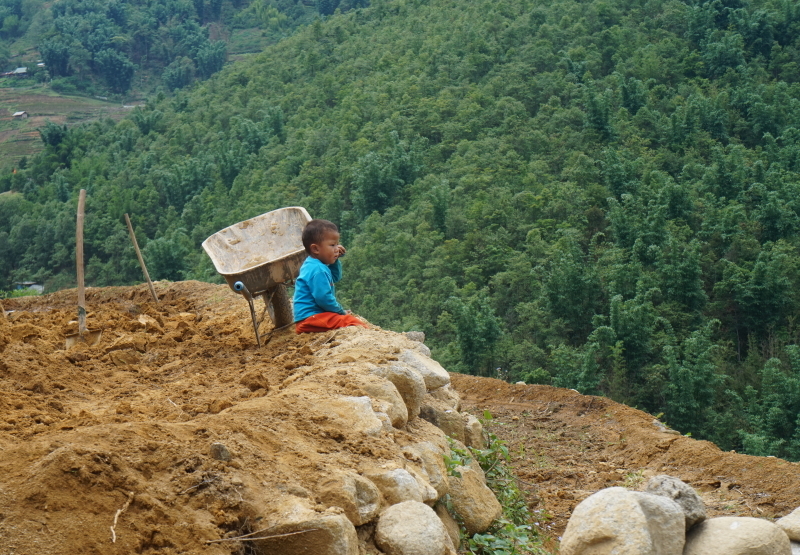 Sapa, wow, what a great experience to read about. Eva, you are catching up to Nancy in height. 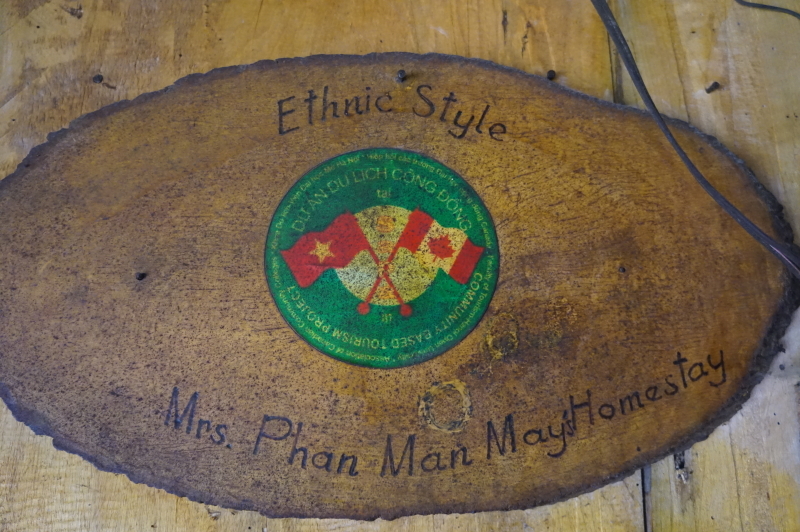 We are getting excited to see you guys once home, can’t promise rice wine but maybe some other beverages to sip and hear about all the adventures. Continued safe travels!